This article is about the dwarf planet. For the Hawaiian goddess, see Haumea (mythology). For other uses, see Haumea (disambiguation). Haumea (minor-planet designation 136108 Haumea) is a possible dwarf planet located beyond Neptune's orbit. It was discovered in 2004 by a team headed by Mike Brown of Caltech at the Palomar Observatory in the United States and independently in 2005, by a team headed by José Luis Ortiz Moreno at the Sierra Nevada Observatory in Spain, though the latter claim has been contested. On September 17, 2008, it was recognized as a dwarf planet by the International Astronomical Union (IAU) and named after Haumea, the Hawaiian goddess of childbirth, though subsequent observations cast doubt on its shape being consistent with hydrostatic equilibrium (and thus perhaps not a dwarf planet). Haumea's mass is about one-third that of Pluto, and 1/1400 that of Earth. Although its shape has not been directly observed, calculations from its light curve indicate that it is a Jacobi ellipsoid, with its major axis twice as long as its minor. Its gravity was until recently thought to be sufficient for it to have relaxed into hydrostatic equilibrium. Haumea's elongated shape together with its rapid rotation and high albedo (from a surface of crystalline water ice), are thought to be the consequences of a giant collision, which left Haumea the largest member of a collisional family that includes several large trans-Neptunian objects (TNOs) and Haumea's two known moons, Hiʻiaka and Namaka. Haumea is currently the third-largest known trans-Neptunian object, after Eris and Pluto. Two teams claim credit for the discovery of Haumea. Mike Brown and his team at Caltech discovered Haumea in December 28, 2004 on images they had taken on May 6, 2004. On July 20, 2005, they published an online abstract of a report intended to announce the discovery at a conference in September 2005. At around this time, José Luis Ortiz Moreno and his team at the Instituto de Astrofísica de Andalucía at Sierra Nevada Observatory in Spain found Haumea on images taken on March 7–10, 2003. Ortiz emailed the Minor Planet Center with their discovery on the night of July 27, 2005. Brown initially conceded discovery credit to Ortiz, but came to suspect the Spanish team of fraud upon learning that his observation logs were accessed from the Spanish observatory the day before the discovery announcement. These logs included enough information to allow the Ortiz team to precover Haumea in their 2003 images, and they were accessed again just before Ortiz scheduled telescope time to obtain confirmation images for a second announcement to the MPC on July 29. Ortiz later admitted he had accessed the Caltech observation logs but denied any wrongdoing, stating he was merely verifying whether they had discovered a new object. Precovery images of Haumea have been identified back to September 22, 1955. IAU protocol is that discovery credit for a minor planet goes to whoever first submits a report to the MPC (Minor Planet Center) with enough positional data for a decent determination of its orbit, and that the credited discoverer has priority in choosing a name. However, the IAU announcement on September 17, 2008, that Haumea had been accepted as a dwarf planet, did not mention a discoverer. The location of discovery was listed as the Sierra Nevada Observatory of the Spanish team, but the chosen name, Haumea, was the Caltech proposal; Ortiz's team had proposed "Ataecina", named for the ancient Iberian goddess of Spring. Until it was given a permanent name, the Caltech discovery team used the nickname "Santa" among themselves, because they had discovered Haumea on December 28, 2004, just after Christmas. The Spanish team were the first to file a claim for discovery to the Minor Planet Center, in July 2005. On July 29, 2005, Haumea was given the provisional designation 2003 EL61, based on the date of the Spanish discovery image. On September 7, 2006, it was numbered and admitted into the official minor planet catalogue as (136108) 2003 EL61. Following guidelines established by the IAU that classical Kuiper belt objects be given names of mythological beings associated with creation, in September 2006 the Caltech team submitted formal names from Hawaiian mythology to the IAU for both (136108) 2003 EL61 and its moons, in order "to pay homage to the place where the satellites were discovered". The names were proposed by David Rabinowitz of the Caltech team. Haumea is the matron goddess of the island of Hawaiʻi, where the Mauna Kea Observatory is located. In addition, she is identified with Papa, the goddess of the earth and wife of Wākea (space), which, at the time, seemed appropriate because Haumea was thought to be composed almost entirely of solid rock, without the thick ice mantle over a small rocky core typical of other known Kuiper belt objects. Lastly, Haumea is the goddess of fertility and childbirth, with many children who sprang from different parts of her body; this corresponds to the swarm of icy bodies thought to have broken off the dwarf planet during an ancient collision. The two known moons, also believed to have formed in this manner, are thus named after two of Haumea's daughters, Hiʻiaka and Nāmaka. Haumea is a plutoid, a dwarf planet located beyond Neptune's orbit. It is classified as a dwarf planet because it is presumed to be massive enough to have been rounded by its own gravity into a shape in hydrostatic equilibrium, but not massive enough to have cleared its neighbourhood of similarly sized objects. Haumea was initially listed as a classical Kuiper belt object in 2006 by the Minor Planet Center, but no longer. The nominal trajectory suggests that Haumea is in a weak 7:12 orbital resonance with Neptune, which would make it a resonant object instead. Although there are precovery images of Haumea dating back to March 22, 1955 from the Palomar Mountain Digitized Sky Survey, further observations of the orbit will be required to verify its dynamic status. Haumea's orbit outside of Neptune is similar to Makemake's. The positions are as of 1 January 2018. Haumea has an orbital period of 284 Earth years, a perihelion of 35 AU, and an orbital inclination of 28°. It passed aphelion in early 1992, and is currently more than 50 AU from the Sun. Haumea's orbit has a slightly greater eccentricity than that of the other members of its collisional family. This is thought to be due to Haumea's weak 7:12 orbital resonance with Neptune gradually modifying its initial orbit over the course of a billion years, through the Kozai effect, which allows the exchange of an orbit's inclination for increased eccentricity. With a visual magnitude of 17.3, Haumea is the third-brightest object in the Kuiper belt after Pluto and Makemake, and easily observable with a large amateur telescope. However, because the planets and most small Solar System bodies share a common orbital alignment from their formation in the primordial disk of the Solar System, most early surveys for distant objects focused on the projection on the sky of this common plane, called the ecliptic. As the region of sky close to the ecliptic became well explored, later sky surveys began looking for objects that had been dynamically excited into orbits with higher inclinations, as well as more distant objects, with slower mean motions across the sky. These surveys eventually covered the location of Haumea, with its high orbital inclination and current position far from the ecliptic. Haumea displays large fluctuations in brightness over a period of 3.9 hours, which can only be explained by a rotational period of this length. This is faster than any other known equilibrium body in the Solar System, and indeed faster than any other known body larger than 100 km in diameter. While most rotating bodies in equilibrium are flattened into oblate spheroids, Haumea rotates so quickly that it is distorted into a triaxial ellipsoid. If Haumea were to rotate much more rapidly, it would distort itself into a dumbbell shape and split in two. This rapid rotation is thought to have been caused by the impact that created its satellites and collisional family. Because Haumea has moons, the mass of the system can be calculated from their orbits using Kepler's third law. The result is 4.2×1021 kg, 28% the mass of the Plutonian system and 6% that of the Moon. Nearly all of this mass is in Haumea. The size of a Solar System object can be deduced from its optical magnitude, its distance, and its albedo. Objects appear bright to Earth observers either because they are large or because they are highly reflective. If their reflectivity (albedo) can be ascertained, then a rough estimate can be made of their size. For most distant objects, the albedo is unknown, but Haumea is large and bright enough for its thermal emission to be measured, which has given an approximate value for its albedo and thus its size. However, the calculation of its dimensions is complicated by its rapid rotation. The rotational physics of deformable bodies predicts that over as little as a hundred days, a body rotating as rapidly as Haumea will have been distorted into the equilibrium form of a triaxial ellipsoid. It is thought that most of the fluctuation in Haumea's brightness is caused not by local differences in albedo but by the alternation of the side view and end view as seen from Earth. The calculated ellipsoid shape of Haumea, 1,960×1,518×996 km (assuming an albedo of 0.73). At the left are the minimum and maximum equatorial silhouettes (1,960×996 and 1,518×996 km); at the right is the view from the pole (1,960×1,518 km). The rotation and amplitude of Haumea's light curve were argued to place strong constraints on its composition. If Haumea were in hydrostatic equilibrium and had a low density like Pluto, with a thick mantle of ice over a small rocky core, its rapid rotation would have elongated it to a greater extent than the fluctuations in its brightness allow. Such considerations constrained its density to a range of 2.6–3.3 g/cm3. By comparison, the Moon, which is rocky, has a density of 3.3 g/cm3, whereas Pluto, which is typical of icy objects in the Kuiper belt, has a density of 1.86 g/cm3. Haumea's possible high density covered the values for silicate minerals such as olivine and pyroxene, which make up many of the rocky objects in the Solar System. This also suggested that the bulk of Haumea was rock covered with a relatively thin layer of ice. A thick ice mantle more typical of Kuiper belt objects may have been blasted off during the impact that formed the Haumean collisional family. Haumea is thought to rotate in just under 4 hours. This rapid rotation causes it to be elongated. −0.2, from photometry at infrared wavelengths of 70 μm. Subsequent light-curve analyses have suggested an equivalent circular diameter of 1,450 km. In 2010 an analysis of measurements taken by Herschel Space Telescope together with the older Spitzer Telescope measurements yielded a new estimate of the equivalent diameter of Haumea—about 1300 km. These independent size estimates overlap at an average geometric mean diameter of roughly 1,400 km. However the observations of a stellar occultation in January 2017 cast a doubt on all those conclusions. The measured shape of Haumea, while elongated as presumed before, appeared to have significantly larger dimensions – according to the data obtained from the occultation Haumea is approximately the diameter of Pluto along its longest axis and about half that at its poles. So, the resulting density of about 1.8 g/cm3 is more in line with densities of other large TNOs. This resulting shape is inconsistent with a homogenous body in hydrostatic equilibrium; although it is expected to be differentiated, it is not known whether that would make its shape consistent with hydrostatic equilibrium. 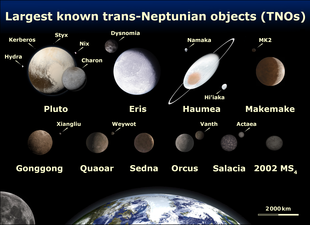 Nevertheless, Haumea appears to be one of the largest trans-Neptunian objects discovered, smaller than Eris, Pluto, similar to Makemake, and possibly 2007 OR10, and larger than Sedna, Quaoar, and Orcus. 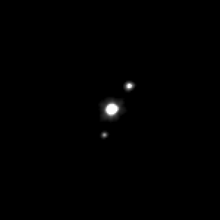 In 2005, the Gemini and Keck telescopes obtained spectra of Haumea which showed strong crystalline water ice features similar to the surface of Pluto's moon Charon. This is peculiar, because crystalline ice forms at temperatures above 110 K, whereas Haumea's surface temperature is below 50 K, a temperature at which amorphous ice is formed. In addition, the structure of crystalline ice is unstable under the constant rain of cosmic rays and energetic particles from the Sun that strike trans-Neptunian objects. The timescale for the crystalline ice to revert to amorphous ice under this bombardment is on the order of ten million years, yet trans-Neptunian objects have been in their present cold-temperature locations for timescales of billions of years. Radiation damage should also redden and darken the surface of trans-Neptunian objects where the common surface materials of organic ices and tholin-like compounds are present, as is the case with Pluto. Therefore, the spectra and colour suggest Haumea and its family members have undergone recent resurfacing that produced fresh ice. However, no plausible resurfacing mechanism has been suggested. Haumea is as bright as snow, with an albedo in the range of 0.6–0.8, consistent with crystalline ice. Other large TNOs such as Eris appear to have albedos as high or higher. Best-fit modeling of the surface spectra suggested that 66% to 80% of the Haumean surface appears to be pure crystalline water ice, with one contributor to the high albedo possibly hydrogen cyanide or phyllosilicate clays. Inorganic cyanide salts such as copper potassium cyanide may also be present. However, further studies of the visible and near infrared spectra suggest a homogeneous surface covered by an intimate 1:1 mixture of amorphous and crystalline ice, together with no more than 8% organics. The absence of ammonia hydrate excludes cryovolcanism and the observations confirm that the collisional event must have happened more than 100 million years ago, in agreement with the dynamic studies. The absence of measurable methane in the spectra of Haumea is consistent with a warm collisional history that would have removed such volatiles, in contrast to Makemake. In addition to the large fluctuations in Haumea's light curve due to the body's shape, which affect all colours equally, smaller independent colour variations seen in both visible and near-infrared wavelengths show a region on the surface that differs both in colour and in albedo. More specifically, a large dark red area on Haumea's bright white surface was seen in September 2009, possibly an impact feature, which indicates an area rich in minerals and organic (carbon-rich) compounds, or possibly a higher proportion of crystalline ice. Thus Haumea may have a mottled surface reminiscent of Pluto, if not as extreme. A stellar occultation observed on 21 January 2017 and described in an 11 October 2017 Nature article indicated the presence of a ring around Haumea. This represents the first ring system discovered for a TNO. The ring has a radius of about 2,287 km, a width of ~70 km and an opacity of 0.5. It is well within Haumea's Roche limit, which would be at a radius of about 4,400 km if it were spherical (being nonspherical pushes the limit out farther). The ring plane approximately coincides with Haumea’s equatorial plane and the orbital plane of its larger, outer moon Hi’iaka. The ring is also close to the 3:1 resonance with Haumea's rotation (which is at a radius of 2,285 ± 8 km). The ring contributes around 5% to the total brightness of Haumea. In a study about the dynamics of ring particles published in 2019, Othon Cabo Winter and colleagues have shown that the 1:3 resonance with Haumea's rotation is dynamically unstable, but that there is a stable region in the phase space consistent with the location of Haumea's ring. This indicates that the ring particles originate on circular, periodic orbits that are close to, but not inside, the resonance. 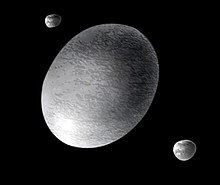 Artist's conception of Haumea with its moons Hiʻiaka and Namaka. The moons are much more distant than depicted here. Two small satellites have been discovered orbiting Haumea, (136108) Haumea I Hiʻiaka and (136108) Haumea II Namaka. Brown's team discovered both in 2005, through observations of Haumea using the W.M. Keck Observatory. Hiʻiaka, at first nicknamed "Rudolph" by the Caltech team, was discovered January 26, 2005. It is the outer and, at roughly 310 km in diameter, the larger and brighter of the two, and orbits Haumea in a nearly circular path every 49 days. Strong absorption features at 1.5 and 2 micrometres in the infrared spectrum are consistent with nearly pure crystalline water ice covering much of the surface. The unusual spectrum, along with similar absorption lines on Haumea, led Brown and colleagues to conclude that capture was an unlikely model for the system's formation, and that the Haumean moons must be fragments of Haumea itself. Namaka, the smaller, inner satellite of Haumea, was discovered on June 30, 2005, and nicknamed "Blitzen". It is a tenth the mass of Hiʻiaka, orbits Haumea in 18 days in a highly elliptical, non-Keplerian orbit, and as of 2008[update] is inclined 13° from the larger moon, which perturbs its orbit. The relatively large eccentricities together with the mutual inclination of the orbits of the satellites are unexpected as they should have been damped by the tidal effects. A relatively recent passage by a 3:1 resonance with Hiʻiaka might explain the current excited orbits of the Haumean moons. At present, the orbits of the Haumean moons appear almost exactly edge-on from Earth, with Namaka periodically occulting Haumea. Observation of such transits would provide precise information on the size and shape of Haumea and its moons, as happened in the late 1980s with Pluto and Charon. The tiny change in brightness of the system during these occultations will require at least a medium-aperture professional telescope for detection. Hiʻiaka last occulted Haumea in 1999, a few years before discovery, and will not do so again for some 130 years. However, in a situation unique among regular satellites, Namaka's orbit is being greatly torqued by Hiʻiaka, which preserved the viewing angle of Namaka–Haumea transits for several more years. Haumea is the largest member of its collisional family, a group of astronomical objects with similar physical and orbital characteristics thought to have formed when a larger progenitor was shattered by an impact. This family is the first to be identified among TNOs and includes—beside Haumea and its moons—(55636) 2002 TX300 (≈364 km), (24835) 1995 SM55 (≈174 km), (19308) 1996 TO66 (≈200 km), (120178) 2003 OP32 (≈230 km), and (145453) 2005 RR43 (≈252 km). Brown and colleagues proposed that the family were a direct product of the impact that removed Haumea's ice mantle, but a second proposal suggests a more complicated origin: that the material ejected in the initial collision instead coalesced into a large moon of Haumea, which was later shattered in a second collision, dispersing its shards outwards. This second scenario appears to produce a dispersion of velocities for the fragments that is more closely matched to the measured velocity dispersion of the family members. The presence of the collisional family could imply that Haumea and its "offspring" might have originated in the scattered disc. In today's sparsely populated Kuiper belt, the chance of such a collision occurring over the age of the Solar System is less than 0.1 percent. The family could not have formed in the denser primordial Kuiper belt because such a close-knit group would have been disrupted by Neptune's migration into the belt—the believed cause of the belt's current low density. Therefore, it appears likely that the dynamic scattered disc region, in which the possibility of such a collision is far higher, is the place of origin for the object that generated Haumea and its kin. Because it would have taken at least a billion years for the group to have diffused as far as it has, the collision which created the Haumea family is believed to have occurred very early in the Solar System's history. It was calculated that a flyby mission to Haumea could take 14.25 years using a Jupiter gravity assist, based on a launch date of 25 September 2025. Haumea would be 48.18 AU from the Sun when the spacecraft arrives. A flight time of 16.45 years can be achieved with launch dates on 1 November 2026, 23 September 2037 and 29 October 2038. Haumea could become a target for an exploration mission, and an example of this work is a preliminary study on a probe to Haumea and its moons (at 35–51 AU). Probe mass, power source, and propulsion systems are key technology areas for this type of mission. ^ how-MAY-ə, with three syllables according to the English pronunciation in Hawaii, or HAH-oo-MAY-ə with four syllables according to Brown's students. ^ a b "MPEC 2010-H75 : DISTANT MINOR PLANETS (2010 MAY 14.0 TT)" (2006 provisional Cubewano listing). Minor Planet Center. 2010-04-10. Retrieved 2010-07-02. ^ a b Marc W. Buie (2008-06-25). "Orbit Fit and Astrometric record for 136108". Southwest Research Institute (Space Science Department). Archived from the original on 2011-05-18. Retrieved 2008-10-02. ^ a b c d Ragozzine, D.; Brown, M. E. (2007). "Candidate Members and Age Estimate of the Family of Kuiper Belt Object 2003 EL61". Astronomical Journal. 134 (6): 2160–2167. arXiv:0709.0328. Bibcode:2007AJ....134.2160R. doi:10.1086/522334. ^ "365 Days of Astronomy". Archived from the original on 2012-02-20. ^ a b c d "Jet Propulsion Laboratory Small-Body Database Browser: 136108 Haumea (2003 EL61)" (2014-11-28 last obs). NASA's Jet Propulsion Laboratory. Archived from the original on 2015-12-27. Retrieved 2015-01-08. ^ a b c d e f g h i j Ortiz, J. L.; Santos-Sanz, P.; Sicardy, B.; et al. (2017). "The size, shape, density and ring of the dwarf planet Haumea from a stellar occultation". Nature. 550 (7675): 219–223. Bibcode:2017Natur.550..219O. doi:10.1038/nature24051. PMID 29022593. ^ a b c Alexandra C. Lockwood; Michael E. Brown; John Stansberry (2014). "The size and shape of the oblong dwarf planet Haumea". Earth, Moon, and Planets. 111 (3–4): 127–137. arXiv:1402.4456v1. Bibcode:2014EM&P..111..127L. doi:10.1007/s11038-014-9430-1. ^ a b Fornasier, S.; Lellouch, E.; Müller, T.; Santos-Sanz, P.; Panuzzo, P.; Kiss, C.; Lim, T.; Mommert, M.; Bockelée-Morvan, D.; Vilenius, E.; Stansberry, J.; Tozzi, G. P.; Mottola, S.; Delsanti, A.; Crovisier, J.; Duffard, R.; Henry, F.; Lacerda, P.; Barucci, A.; Gicquel, A. (2013). ""TNOs are cool": A survey of the trans-Neptunian region VIII. Combined Herschel PACS and SPIRE observations of nine bright targets at 70–500 μm" (PDF). Astronomy and Astrophysics. 555: A15. arXiv:1305.0449. Bibcode:2013A&A...555A..15F. doi:10.1051/0004-6361/201321329. Archived (PDF) from the original on 2014-12-05. ^ a b Ragozzine, D.; Brown, M. E. (2009). "Orbits and Masses of the Satellites of the Dwarf Planet Haumea = 2003 EL61". The Astronomical Journal. 137 (6): 4766–4776. arXiv:0903.4213. Bibcode:2009AJ....137.4766R. doi:10.1088/0004-6256/137/6/4766. ^ "Ellipsoid surface area: 9.16736×10^6 km²". wolframalpha.com. 22 July 2018. ^ "Ellipsoid volume: 2.35761×10^9 km³". wolframalpha.com. 22 July 2018. ^ a b c Lellouch, E.; Kiss, C.; Santos-Sanz, P.; Müller, T. G.; Fornasier, S.; Groussin, O.; Lacerda, P.; Ortiz, J. L.; Thirouin, A.; Delsanti, A.; Duffard, R.; Harris, A. W.; Henry, F.; Lim, T.; Moreno, R.; Mommert, M.; Müller, M.; Protopapa, S.; Stansberry, J.; Trilling, D.; Vilenius, E.; Barucci, A.; Crovisier, J.; Doressoundiram, A.; Dotto, E.; Gutiérrez, P. J.; Hainaut, O.; Hartogh, P.; Hestroffer, D.; Horner, J. (2010). ""TNOs are cool": A survey of the trans-Neptunian region II. The thermal lightcurve of (136108) Haumea". Astronomy and Astrophysics. 518: L147. arXiv:1006.0095. Bibcode:2010A&A...518L.147L. doi:10.1051/0004-6361/201014648. ^ a b P. Lacerda; D. Jewitt & N. Peixinho (2008). "High-Precision Photometry of Extreme KBO 2003 EL61". Astronomical Journal. 135 (5): 1749–1756. arXiv:0801.4124. Bibcode:2008AJ....135.1749L. doi:10.1088/0004-6256/135/5/1749. ^ a b c d e f g Chadwick A. Trujillo, Michael E. Brown, Kristina Barkume, Emily Shaller, David L. Rabinowitz (2007). "The Surface of 2003 EL61 in the Near Infrared". Astrophysical Journal. 655 (2): 1172–1178. arXiv:astro-ph/0601618. Bibcode:2007ApJ...655.1172T. doi:10.1086/509861. ^ Snodgrass, C.; Carry, B.; Dumas, C.; Hainaut, O. (February 2010). "Characterisation of candidate members of (136108) Haumea's family". Astronomy and Astrophysics. 511: A72. arXiv:0912.3171. Bibcode:2010A&A...511A..72S. doi:10.1051/0004-6361/200913031. ^ a b Rabinowitz, D. L.; Schaefer, Bradley E.; Schaefer, Martha; Tourtellotte, Suzanne W. (2008). "The Youthful Appearance of the 2003 EL61 Collisional Family". The Astronomical Journal. 136 (4): 1502–1509. arXiv:0804.2864. Bibcode:2008AJ....136.1502R. doi:10.1088/0004-6256/136/4/1502. ^ a b c "AstDys (136108) Haumea Ephemerides". Department of Mathematics, University of Pisa, Italy. Archived from the original on 2011-06-29. Retrieved 2009-03-19. ^ a b "HORIZONS Web-Interface". NASA Jet Propulsion Laboratory Solar System Dynamics. Archived from the original on 2008-07-18. Retrieved 2008-07-02. ^ a b c "IAU names fifth dwarf planet Haumea". IAU Press Release. 2008-09-17. Archived from the original on 2011-07-02. Retrieved 2008-09-17. ^ Michael E Brown. "The electronic trail of the discovery of 2003 EL61". CalTech. Archived from the original on 2006-09-01. Retrieved 2006-08-16. ^ a b c Pablo Santos Sanz (2008-09-26). "La historia de Ataecina vs Haumea" (in Spanish). infoastro.com. Archived from the original on 2008-09-29. Retrieved 2008-09-29. ^ Michael E. Brown. How I Killed Pluto and Why It Had It Coming, chapter 9: "The Tenth Planet"
^ Jeff Hecht (2005-09-21). "Astronomer denies improper use of web data". New Scientist.com. Archived from the original on 2011-03-13. Retrieved 2009-01-12. ^ a b c "Dwarf Planets and their Systems". US Geological Survey Gazetteer of Planetary Nomenclature. Archived from the original on 2011-06-29. Retrieved 2008-09-17. ^ Rachel Courtland (2008-09-19). "Controversial dwarf planet finally named 'Haumea'". NewScientistSpace. Archived from the original on 2008-09-19. Retrieved 2008-09-19. ^ "Santa et al". NASA Astrobiology Magazine. 2005-09-10. Archived from the original on 2006-04-26. Retrieved 2008-10-16. ^ "Naming of Astronomical Objects: Minor planets". International Astronomical Union. Archived from the original on 2008-12-16. Retrieved 2008-11-17. ^ Mike Brown (2008-09-17). "Dwarf planets: Haumea". CalTech. Archived from the original on 2008-09-15. Retrieved 2008-09-18. ^ a b Robert D. Craig (2004). Handbook of Polynesian Mythology. ABC-CLIO. p. 128. ISBN 978-1-57607-894-5. ^ a b "News Release – IAU0807: IAU names fifth dwarf planet Haumea". International Astronomical Union. 2008-09-17. Archived from the original on 2009-07-08. Retrieved 2008-09-18. ^ a b c d e f g h i Brown, M. E.; Barkume, K. M.; Ragozzine, D.; Schaller, L. (2007). "A collisional family of icy objects in the Kuiper belt". Nature. 446 (7133): 294–296. Bibcode:2007Natur.446..294B. doi:10.1038/nature05619. PMID 17361177. ^ a b c Michael E. Brown. "The largest Kuiper belt objects" (PDF). CalTech. Archived (PDF) from the original on 2008-10-01. Retrieved 2008-09-19. ^ Nesvorný, D; Roig, F. (2001). "Mean Motion Resonances in the Transneptunian Region Part II: The 1 : 2, 3 : 4, and Weaker Resonances". Icarus. 150 (1): 104–123. Bibcode:2001Icar..150..104N. doi:10.1006/icar.2000.6568. ^ Kuchner, Marc J.; Brown, Michael E.; Holman, Matthew (2002). "Long-Term Dynamics and the Orbital Inclinations of the Classical Kuiper Belt Objects". The Astronomical Journal. 124 (2): 1221–1230. arXiv:astro-ph/0206260. Bibcode:2002AJ....124.1221K. doi:10.1086/341643. ^ a b c d e f g h Rabinowitz, D. L.; Barkume, Kristina; Brown, Michael E.; Roe, Henry; Schwartz, Michael; Tourtellotte, Suzanne; Trujillo, Chad (2006). "Photometric Observations Constraining the Size, Shape, and Albedo of 2003 EL61, a Rapidly Rotating, Pluto-Sized Object in the Kuiper Belt". Astrophysical Journal. 639 (2): 1238–1251. arXiv:astro-ph/0509401. Bibcode:2006ApJ...639.1238R. doi:10.1086/499575. ^ C. A. Trujillo & M. E. Brown (June 2003). "The Caltech Wide Area Sky Survey". Earth, Moon, and Planets. 112 (1–4): 92–99. Bibcode:2003EM&P...92...99T. doi:10.1023/B:MOON.0000031929.19729.a1. ^ Brown, M. E.; Trujillo, C.; Rabinowitz, D. L. (2004). "Discovery of a candidate inner Oort cloud planetoid". The Astrophysical Journal. 617 (1): 645–649. arXiv:astro-ph/0404456. Bibcode:2004ApJ...617..645B. doi:10.1086/422095. ^ Schwamb, M. E.; Brown, M. E.; Rabinowitz, D. L. (2008). "Constraints on the distant population in the region of Sedna". American Astronomical Society, DPS Meeting #40, #38.07. 40: 465. Bibcode:2008DPS....40.3807S. ^ a b Agence France-Presse (2009-09-16). "Astronomers get lock on diamond-shaped Haumea". European Planetary Science Congress in Potsdam. News Limited. Archived from the original on 2009-09-23. Retrieved 2009-09-16. ^ Brown, M. E.; Bouchez, A. H.; Rabinowitz, D.; Sari, R.; Trujillo, C. A.; Van Dam, M.; Campbell, R.; Chin, J.; Hartman, S.; Johansson, E.; Lafon, R.; Le Mignant, D.; Stomski, P.; Summers, D.; Wizinowich, P. (2005). "Keck Observatory laser guide star adaptive optics discovery and characterization of a satellite to large Kuiper belt object 2003 EL61" (PDF). Astrophysical Journal Letters. 632 (1): L45. Bibcode:2005ApJ...632L..45B. doi:10.1086/497641. Archived (PDF) from the original on 2010-06-10. ^ a b c Stansberry, J.; Grundy, W.; Brown, M.; Cruikshank, D.; Spencer, J.; Trilling, D.; Margot, J-L. (2008). "Physical Properties of Kuiper Belt and Centaur Objects: Constraints from Spitzer Space Telescope". The Solar System Beyond Neptune. University of Arizona Press: 161. arXiv:astro-ph/0702538. Bibcode:2008ssbn.book..161S. ^ Lacerda, P.; Jewitt, D. C. (2007). "Densities of Solar System Objects from Their Rotational Light Curves". Astronomical Journal. 133 (4): 1393–1408. arXiv:astro-ph/0612237. Bibcode:2007AJ....133.1393L. doi:10.1086/511772. ^ "Charon: An ice machine in the ultimate deep freeze" (Press release). Gemini Observatory. 17 July 2007. Archived from the original on 7 June 2011. Retrieved 2007-07-18. ^ Brown, M. E.; Schaller, E. L.; Roe, H. G.; Rabinowitz, D. L.; Trujillo, C. A. (2006). "Direct measurement of the size of 2003 UB313 from the Hubble Space Telescope" (PDF). The Astrophysical Journal Letters. 643 (2): L61–L63. arXiv:astro-ph/0604245. Bibcode:2006ApJ...643L..61B. doi:10.1086/504843. Archived (PDF) from the original on 2008-09-10. ^ Pinilla-Alonso, N.; Brunetto, R.; Licandro, J.; Gil-Hutton, R.; Roush, T. L.; Strazzulla, G. (2009). "Study of the Surface of 2003 EL61, the largest carbon-depleted object in the trans-neptunian belt". Astronomy and Astrophysics. 496 (2): 547–556. arXiv:0803.1080. Bibcode:2009A&A...496..547P. doi:10.1051/0004-6361/200809733. ^ Tegler, S. C.; Grundy, W. M.; Romanishin, W.; Consolmagno, G. J.; Mogren, K.; Vilas, F. (2007). "Optical Spectroscopy of the Large Kuiper Belt Objects 136472 (2005 FY9) and 136108 (2003 EL61)". The Astronomical Journal. 133 (2): 526–530. arXiv:astro-ph/0611135. Bibcode:2007AJ....133..526T. doi:10.1086/510134. ^ P. Lacerda (2009). "Time-Resolved Near-Infrared Photometry of Extreme Kuiper Belt Object Haumea". Astronomical Journal. 137 (2): 3404–3413. arXiv:0811.3732. Bibcode:2009AJ....137.3404L. doi:10.1088/0004-6256/137/2/3404. ^ "Strange Dwarf Planet Has Red Spot". Space.com. 15 September 2009. Archived from the original on 21 November 2009. Retrieved 2009-11-12. ^ Surprise! Dwarf Planet Haumea Has a Ring, Sky and Telescope, October 13, 2017. ^ K. Chang (20 March 2007). "Piecing Together the Clues of an Old Collision, Iceball by Iceball". New York Times. Archived from the original on 12 November 2014. Retrieved 2008-10-12. ^ Brown, M. E.; Bouchez, A. H.; Rabinowitz, D.; Sari, R.; Trujillo, C. A.; Van Dam, M.; Campbell, R.; Chin, J.; Hartman, S.; Johansson, E.; Lafon, R.; Le Mignant, D.; Stomski, P.; Summers, D.; Wizinowich, P. (2005). "Keck Observatory Laser Guide Star Adaptive Optics Discovery and Characterization of a Satellite to the Large Kuiper Belt Object 2003 EL61" (PDF). Astrophysical Journal Letters. 632 (1): L45–L48. Bibcode:2005ApJ...632L..45B. doi:10.1086/497641. ^ Brown, M. E.; Van Dam, M. A.; Bouchez, A. H.; Le Mignant, D.; Campbell, R. D.; Chin, J. C. Y.; Conrad, A.; Hartman, S. K.; Johansson, E. M.; Lafon, R. E.; Rabinowitz, D. L. Rabinowitz; Stomski, P. J., Jr.; Summers, D. M.; Trujillo, C. A.; Wizinowich, P. L. (2006). "Satellites of the Largest Kuiper Belt Objects" (PDF). The Astrophysical Journal. 639 (1): L43–L46. arXiv:astro-ph/0510029. Bibcode:2006ApJ...639L..43B. doi:10.1086/501524. Archived (PDF) from the original on 2013-11-03. Retrieved 2011-10-19. ^ K. M. Barkume; M. E. Brown & E. L. Schaller (2006). "Water Ice on the Satellite of Kuiper Belt Object 2003 EL61". Astrophysical Journal Letters. 640 (1): L87–L89. arXiv:astro-ph/0601534. Bibcode:2006ApJ...640L..87B. doi:10.1086/503159. ^ Green, Daniel W. E. (1 December 2005). "Iauc 8636". Archived from the original on 12 March 2018. ^ a b Ragozzine, D.; Brown, M. E.; Trujillo, C. A.; Schaller, E. L. (2008). "Orbits and Masses of the 2003 EL61 Satellite System". American Astronomical Society. AAS DPS conference 2008. 40: 462. Bibcode:2008DPS....40.3607R. ^ "IAU Circular 8949". International Astronomical Union. 17 September 2008. Archived from the original on 11 January 2009. Retrieved 2008-12-06. ^ a b c "Mutual events of Haumea and Namaka". Archived from the original on 2009-02-24. Retrieved 2009-02-18. ^ L.-A. A. McFadden; P. R. Weissman; T. V. Johnson (2007). Encyclopedia of the Solar System. Academic Press. ISBN 978-0-12-088589-3. ^ a b Fabrycky, D. C.; Holman, M. J.; Ragozzine, D.; Brown, M. E.; Lister, T. A.; Terndrup, D. M.; Djordjevic, J.; Young, E. F.; Young, L. A.; Howell, R. R. (2008). "Mutual Events of 2003 EL61 and its Inner Satellite". American Astronomical Society. AAS DPS conference 2008. 40: 462. Bibcode:2008DPS....40.3608F. ^ M. Brown (18 May 2008). "Moon shadow Monday (fixed)". Mike Brown's Planets. Archived from the original on 1 October 2008. Retrieved 2008-09-27. ^ a b Schlichting, H. E.; Sari, R. (2009). "The Creation of Haumea's Collisional Family". The Astrophysical Journal. 700 (2): 1242–1246. arXiv:0906.3893. Bibcode:2009ApJ...700.1242S. doi:10.1088/0004-637X/700/2/1242. ^ a b c Levison, H. F.; Morbidelli, A.; Vokrouhlický, D.; Bottke, W. F. (2008). "On a Scattered Disc Origin for the 2003 EL61 Collisional Family—an Example of the Importance of Collisions in the Dynamics of Small Bodies". Astronomical Journal. 136 (3): 1079–1088. arXiv:0809.0553. Bibcode:2008AJ....136.1079L. doi:10.1088/0004-6256/136/3/1079. ^ a b Poncyb, Joel; Fontdecaba Baiga, Jordi; Feresinb, Fred; Martinota, Vincent (2011). "A preliminary assessment of an orbiter in the Haumean system: How quickly can a planetary orbiter reach such a distant target?". Acta Astronautica. 68 (5–6): 622–628. Bibcode:2011AcAau..68..622P. doi:10.1016/j.actaastro.2010.04.011. Wikimedia Commons has media related to 136108 Haumea. This page was last edited on 24 April 2019, at 02:09 (UTC).